Afridi at the seminar in Riyadh. In the last five to 10 years, several fire incidents have destroyed buildings all over the world, resulting in the loss of human lives and property. Unfortunately, all the concerned stakeholders focus on the safety issues just when such incidents take place, only to forget them later on, said Altaf Afridi, the UAE-based regional marketing director – Mena (Middle East and North Africa) of Dorma Gulf Door Controls and head of project management team. 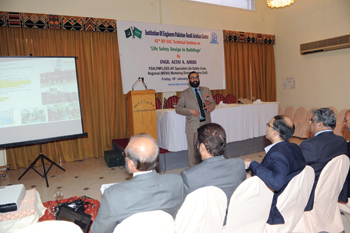 Afridi was addressing a technical seminar on Life Safety Design in Buildings organised by the Institute of Engineers Pakistan, Saudi Arabian Centre (IEP-SAC) in Riyadh, Saudi Arabia, and attended by Khayyam Akbar, assistant ambassador, Embassy of Pakistan in Riyadh and IEP general secretary Syed Iqbal Ahmed. The seminar, which was held in January, was the latest in a series of regional events where Dorma, a premium access and door solutions provider, has focused on raising awareness in the market on various safety and security issues, and on how to safeguard buildings from the risk of fire. At the seminar which was attended by engineers in the kingdom, Afridi highlighted different aspects of building design aimed at ensuring human safety and protecting property and shed light about codes such as NFPA 101 and NFPA 80. He said a search on the Internet on the history of fires will reveal thousands of such events and similar stories. Comparing the readiness of different regions with regard to the issue, Afridi said in developed nations, which have a longer history of buildings and fires, there is greater awareness as they have learned their lessons the hard way. The Middle East and Asia region can benefit from the lessons learnt by the developed countries by adopting the building, fire and life safety codes that they have drawn up. These have been formulated in a systematic manner to address specific issues and ensure the safety of humans and also property to some extent – life safety codes’ foremost concern is the life of occupants with protection of properties addressed by other codes. “The codes have been developed based on the history of a series of incidents and are regularly updated to incorporate new lessons learnt in the rapidly changing construction environment,” he added. Afridi pointed out with buildings getting more and more complex, codes are being revised promptly to make the life of occupants more secure, safe and comfortable. • An architectural means of safe egress. Afridi underscored the paramount importance of ensuring a safe building structure. “After that, all the other three systems have to be integrated in a balanced way. Generally, it is the systems that do not require regular maintenance and those that provide free egress in case of fire and other emergencies that form the backbone of life safety features in a building,” he emphasised. He concluded by saying that seminars such as the Life Safety Design in Buildings provide building industry professionals with an opportunity to keep abreast of safety in design and contribute to creating awareness and implementing safety codes in buildings for the protection of occupants.